SIOUX CITY | Terrance “Terry” W. Lewis, 79, of Houston, Texas, formerly of Sioux City, passed away peacefully on Wednesday, Sept. 23, 2015, in Houston. Services will be 10 a.m. Friday, Oct. 2, at All Saints Catholic Church, 215 East 10th Street in Houston, with the Rev. Donald Nesti officiating. Arrangements are under the direction of Joseph J. Earthman Generations in Houston. Terry was born Feb. 17, 1936, in Sioux City, to Kenneth and Helen Lewis. Raised in Sioux City, Terry graduated from Heelan High School in 1954, and attended Morningside College, where he played football. 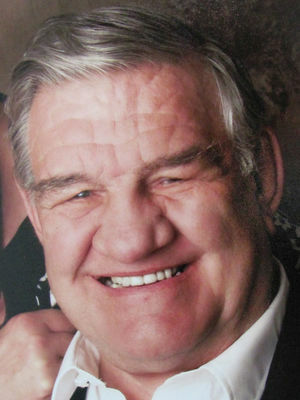 Terry was a professional heavyweight boxer based in Spokane, Wash., from 1955 to 1960. He finished with a 22-2 record and 19 knockouts. During this time he proudly served his country as a member of the Washington Air National Guard. Terry and Nancy married on Dec. 19, 1959. He returned to Sioux City after boxing to take care of his father and raise his family. During his time in Sioux City, he proudly served his community as a sergeant with the Sioux City Police Department, as a business owner, and insurance agent. In 1986, Terry and Nancy moved to Tempe, Ariz., where he lived and worked as a flooring contractor for 25 years. From there, they moved to Portland, Ore., until moving to Houston in 2014. Terry loved the outdoors and spent a majority of his free time hunting. An avid woodworker and master craftsman, Terry created furniture for family and friends. He is survived by his loving wife of 55 years, Adell “Nancy;" children, Michael Lewis, John Lewis and wife, Michele, Bill Lewis and partner, Stephanie Gorman, Julie Vogel and husband, Peter, and Lisa Lewis; grandchildren, Matthew, Ryan, Amanda, Benjamin, Riley, Sawyer, Sophie, Taylor, Alex, and Aiden; great-grandchildren, Jacob and Stephen; siblings, Florence Campbell, Katie Dion and husband, Paul, Charles Lewis and wife, Linda, as well as numerous members of his extended family.